It is seven days from Christmas 2007 and that puts us one step closer to Shopocalypse according to Rev. Billy of the Church of Stop Shopping. No American shopper would want to be bothered by the true impact of her consuming behavior at this time of the year. Christmas is so instilled in our social existence in North America that even the most conscientious, eco-friendly and sustainable-living oriented folks out there want to make exemptions to please loved ones. No one wants to be the Grinch. Director Rob VanAlkemade’s documentary What Would Jesus Buy? is a sobering film about the lengths we all go to avoid being the Grinch and how we are hurling ourselves toward Shopocalypse because of our consumerism and over-consumption. Rev. Billy is upset because Americans went from being a nation of producers to a nation of consumers. He is upset because the average household savings for Americans is below zero. Sixty percent of us are in debt and yet, we still spend at least five hours a week shopping. Around Christmas time, our over-consumption leads to an extra 5 million tons of waste. That is mostly wrapping paper, bows and other packaging for gifts. Yet, try taking a gift to a family Christmas gathering wrapped in newspaper and see the reaction on Uncle Bill’s face. What VanAlkemade is trying to convey in this comedy is that we don’t have to buy a gift to give a gift. He illustrates starkly through interviews the moral lows to which people sink in order to make loved ones happy. One Best Buy associate recalls a 60-year-old grandmother spitting on her face when she informed the customer that there were no more PlayStation 3s to buy. Rev. Billy, while living in New York in the late 1990s, says one morning he woke up and “didn’t know where I was. My neighborhood had become a mall.” For presidential hopeful Rudy Giuliani, this is a resume booster. For Rev. Billy, it became the moment of revelation that Mickey Mouse was indeed the Antichrist. 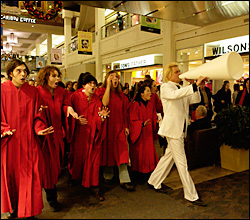 From a one-man show on Times Square, the Church of Stop Shopping soon became a congregation with 31 singers and a seven-piece band. They set out in two biodiesel buses to get people to change their ways — if not to stop shopping, at least to slow down. Rev. Billy especially dislikes Big Box stores – Wal-Mart, Target, Best Buy, Starbucks are among his favorite exorcism and rally sites. Interestingly, many Average Joes and Janes interviewed by VanAlkemade outside these outfits realize their sins. They seem to acknowledge slave labor practices at the sweatshops used by these conglomerates and that the products are of inferior quality. But all of the responses ultimately end in: “What am I supposed to do, boycott the place?” That’s exactly what VanAlkemade and Rev. Billy are trying to imply throughout the film – starting to vote with your dollar. Let’s face it: In the 21st century, the vote one casts with her dollar carries more weight than the vote she casts at the polls. Unfortunately, this is where the film falls short of its ambitious theme. Only in one little scene Rev. Billy’s wife explains that they don’t really mean to tell people not to buy anything. She recommends looking for the “Made in USA” label first and then thinking about to where the money will come back. If it comes back to support local communities, then it’s a good choice. However, that’s ambiguous advice for those who have not given thought to their consuming. Usually, this reviewer is against documentary makers slapping on “What You Can Do” segments at the end of their projects, but this film has a broad enough message that probably should have been explored a little more clearly. There are scenes of Rev. Billy applying White Rain spray on his hair, are these supposed to be ironic moments or slips into hypocrisy? We then see an interview with a Wal-Mart employee who says she works 96 hours a week, but cannot name a “benefit.” We see fair trade experts who reveal that 13-year-olds in Bangladesh work seven days a week for 19 hours shifts at seven cents an hour to produce Disney products, but then we watch little Roxanne Elizabeth getting baptized by Rev. Billy in front of a Staples. The question is whether VanAlkemade, Spurlock and Rev. Billy are mocking the general American public for its habits. Are they trying to be too ironic or are they really analyzing an important social phenomenon and looking for answers? The jury is out on that one. What Would Jesus Buy? is a hilarious and daring documentary and features a few moments when a serious moral message almost peeks through. Given the sensitivity of the issue of consumerism in this land, one cannot blame the filmmaking team for avoiding head-on collision with controversy. Nevertheless, it would have been an even more efficient tool for social change if it dared American consumers to be the Grinch that boycotts Big Box stores and all Chinese goods, wraps gifts in newspaper and offers coupons of favors instead of plastic crap.